It goes to show you how breakthrough Oreo’s “You Can Still Dunk in the Dark” ad is: When you Google “Oreo ad,” the brand’s actual big-production Super Bowl commercial places 11th in the results. Results one through seven are all for the spur-of-the-moment Twitter ad that, well, gamely took advantage of the Super Bowl’s blackout to exploit the power of real-time advertising. Maybe the numbers on this don’t need crunching with this crowd, but here they are: The Super Bowl spot -- even without production thrown in -- cost $4 million. The Twitter ad? Well, it was free, natch. Except for whatever it cost -- a case of beer and some munchies, perhaps? -- to have Oreo digital shop 360i and members of the brand team holed up in a conference room during The Big Game, waiting for something, anything, to happen that would help the brand piggyback on whatever might arise. We’ve come a long way from those “I’m going to Disney World!” commercials. It’s enough to make one think that 360i and the Oreo brand had someone stationed down in New Orleans, trying to surreptitiously trip over power cables. But, as memorable as the Oreo ad was, there’s one thing it was not: the future of advertising. Real-time bidding may become an integral part of how the advertising community does business; real-time advertising, not so much. Consider the confluence: a blackout, during the biggest television and Twitter event of the year, with an agency, and a client at the ready, fully prepared to capitalize on capturing the real-time audience. Yeah, like that’s an everyday occurrence. And, in fact, most days -- instead of coalescing around one event -- we disperse into millions of customized media habits that also don’t lend themselves to real-time advertising. So go bid in real-time on ad units, all you want. But I’m looking hard at the paradigm marked “real-time ads” right now, and it doesn’t seem to be shifting. 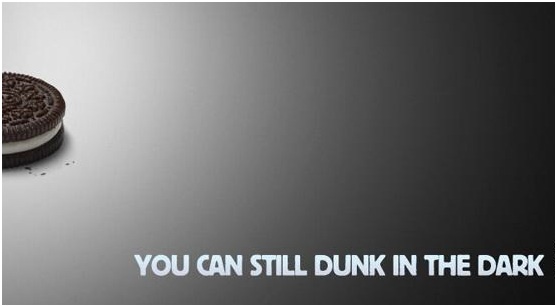 6 comments about "Like Oreo, You Can Dunk in the Dark -- Just Not That Often". Chris Kooluris from VaynerMedia , February 8, 2013 at 3:29 p.m.
Great article Catherine. Because most marketing is trying to be culturally relevant, it's not surprising to see real-time ads/content being developed. Here's what's going to happen / already is happening - every brand and their mother is going to jump on every cultural moment. And most, will do nothing more than force the brand's message onto that moment. We sort of forgive/don't care about OREO doing it because we freaking love OREO cookies. But somewhere out there, a brand manager for, let's say DRAIN-O is thinking - we really need to get into this real-time game...so then DRAIN-O's putting out content, and so on and so on. Then we'll live in a world where thousands of brands are all doing it and guess what, consumers won't care anymore. It will just become noise. One thing I disagree with is the frequency of monumental moments. They happen everyday. Just look at the news. Now, what brands need to be doing more of is thinking about how they can add value to those cultural moments. Right now they are treating their marketing content as the value exchange with consumers. This will grow old real soon. What consumers really want is to see brands DO COOL STUFF, not just make ads that pay homage to a moment. If you nail the action, then the marketing falls into place so easily. Like when Taco Bell lowered a truck full of Tacos into Alaska. That action became the ad. Cultural Moment + Action + marketing push = win. Howie Goldfarb from Blue Star Strategic Marketing, February 8, 2013 at 3:54 p.m. I have some issues with this Catherine. First off only people who know there is an Oreo's Ad will google it. 99.99999% of the earth has no idea about this twitter event. It is almost 100% in the advertising world. Who is going read these articles that show up in the search results? Not Joe and Nancy from Paduka who work as a Technician and a School teacher and have 3 kids and struggle to even afford oreos. I guess I get flustered when the Ad Industry blows u some event like the world was watching (Old spice for example) when in reality so few people outside the industry know about them. I estimated that of the original 10 mil views for Old Spice on You Tube there was 150-200k unique viewers and of them 80% in our industry. So not sure how this benefits a brand other than getting kudos in the ad Trade Pubs while the brand sees no bump in sales. Howie Goldfarb from Blue Star Strategic Marketing, February 8, 2013 at 4:59 p.m.
Chris Kooluris from VaynerMedia , February 8, 2013 at 5:44 p.m. It's funny how marketers are almost always convinced only marketers are paying attention. May be true. But in that case, why even do marketing? Howie, I would love it if brands turned off "paid" support and "paid clicks" and just see how much authentic earned/organic attention/awareness occurred. Will never happen because the agencies want to show the client arbitrary reach numbers so the client can sleep well feeling people saw it (even if they didn't want to). The benefit to the brand with regards to real time is definitely ROI. The cost to make the "lights out" micro content vs the reach was a huge home run. Also, come on, nobody is struggling to pay for Oreos. Audi cars maybe, but not Oreos. Cathy Taylor from MediaPost, February 8, 2013 at 6:53 p.m.
Good to see a conversation going on. Howie, as far as my reference to Google results, that in no way is the centerpiece of the story. It was simply a proxy -- and one of the best ones I can think of -- for the huge evidence that the ad that clearly generated the buzz, inside and outside the industry, was not the $4 million Super Bowl ad. I should also mention that only one of the results I reference came from an ad industry pub, the Forbes ad blog. The rest were Reuters, ABC News, Washington Post, and so on. But the real point is that such buzz, whether just among us ad types or not, will lead some marketers to the wrong conclusion: that real-time advertising is where it's at, when it actually isn't. Chris Kooluris from VaynerMedia , February 9, 2013 at 7:48 a.m. It's not black or white like you suggest. If we really zoom out, you see a world where most consumers don't want ANY marketing at all. Just look at click-through rates, pre-roll sentiment, and DVR subscriptions. People are trying to avoid the marketing at all cost. Did people try and avoid Red Bull's space jump? That was real-time, no? A well executed real-time marketing effort has a better chance of doing what all marketing is essentially trying to do - get people's attention, get them to talk about it, and have them remember that thing when making a purchasing decision. Who knows what the future of advertising will be (probably minority report tactics that will force me to hear the PC Richards jingle every time I cross Union Square in NYC). But surely you can't deny real-time's effectiveness and the fact that it will be playing a much larger role in all marketing moving forward.